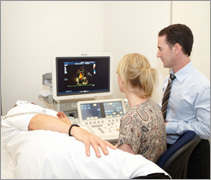 An Echocardiogram (echo) is a non-invasive, safe and effective test to study the anatomy and function of the heart. It uses sound waves (ultrasound) to form images of the structures of the heart. The ultrasound and electrocardiography (ECG) signals are recorded digitally to be reviewed by the Cardiologist. The test can evaluate the size of the different chambers of the heart, the quality of the valves, measure the heart’s pumping ability and identify other problems of the heart that may increase a person’s risk for dangerous arrhythmias. A specially trained technologist does the test. There is no preparation for this test and a patient may eat or drink prior to the study. A patient gown will be put on and the patient will be asked to lie down on an examination table. The lights in the room are dimmed to allow for better viewing of the monitor by the technologist performing the test. Electrodes (adhesive stickers that are attached to wires called leads) are placed on the patient’s skin on the chest so that an ECG can be recorded with the ultrasound recordings during the test. The area where the electrodes are placed is usually cleansed to assure a good recording. A clear gel is applied to the chest and a transducer placed on the chest over the gel. It is moved around the chest so the technologist can record different views of the patient’s heart. The patient may be asked to move from back to side, breathe slowly or hold their breath for a few seconds during the test. This helps improve the quality of the pictures recorded. The technologist is constantly monitoring the pictures on a television screen. They also record a Doppler (speed of the blood flowing through the heart) echocardiogram and you will hear a swooshing sound correlating to your heartbeat. The whole test takes approximately 45 minutes. Determine the size of the chambers of the heart, which can change with conditions such as hypertension, heart damage with a myocardial infarction or congestive heart failure. Determine the heart’s pumping ability. Assess the structure, thickness and movement of the heart valves. Determine if there are any other structural or functional defects of the heart. Ultrasound is a very high frequency sound wave. During an echocardiogram, these ultrasound waves are sent by a transducer (microphone- like device) through the patient’s chest wall to the heart. The ultrasound beam hits different types of tissue in the heart (blood, muscle), all with various densities (thickness), and reflects back through the transducer. The machine analyses the reflected ultrasound beams. The amount of time it took for the beam to travel through the body tissue and back to the machine is analysed and determines the size, shape, thickness and movement of the different structures in the heart. There are no known risks associated with a standard transthoracic echocardiogram.